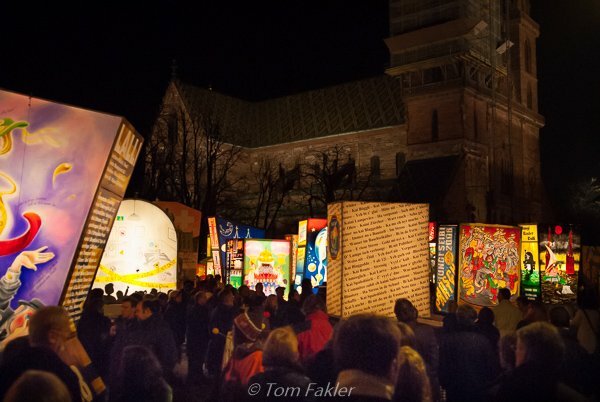 I love quirky cultural traditions, and Basel’s Carnival celebration is right up there when it comes to quirky. In our years in Switzerland, Tom and I have enjoyed the festivities all the more since we learned some of the back story. Called the “drey scheenschte Dääg”, or “three most beautiful days” of the year by Basel residents, just about everything about Fasnacht here involves uniquely local traditions. 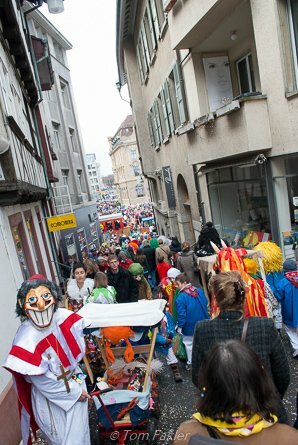 Spectators are welcome to observe Fasnacht, but carnival in Basel is a purely local event, put on by locals, for locals. It’s like a big family party, with everything in Basel Deutsch, the local German dialect. Much of the subject matter being parodied in parades and other events is local as well. This means that there are many in-jokes, more or less unintelligible even to people from other parts of Switzerland. 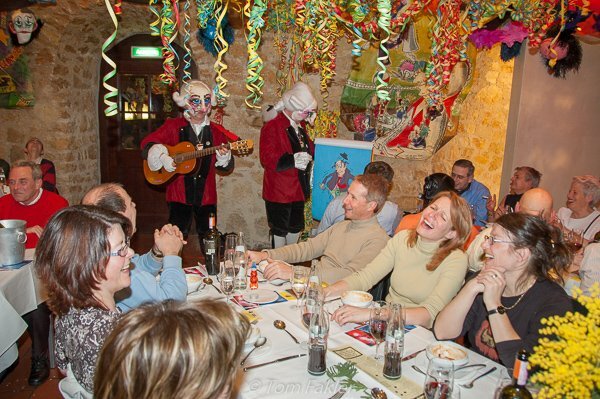 The best way to experience Fasnacht is in the company of a local, who can decipher the arcana and translate the humor. 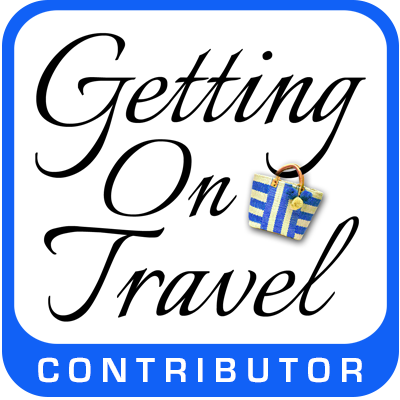 With or without a guide, though, it helps to be aware of key Fasnacht terms. Schnitzelbank performances are beloved among Fasnacht goers. With humorous verses sung entirely in Basel dialect, the punch line is definitely an inside joke. 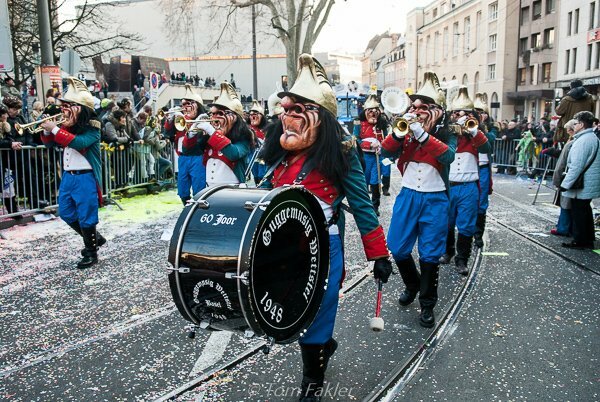 The three formative elements of Basel Fasnacht are introduced from the first day of Carnival. The Winteraustreibung, or chasing-away-winter-with-fire rituals, is represented by the lanterns at Morgenstreich and on exhibit in the evening. For an intense dose of fire rituals, many people head for nearby Liestal on the Sunday evening before Morgenstreich. There, Chienbäse provides enough pyrotechnics to rid all of Northwest Switzerland of winter in one go. The annual exhibition of painted lanterns is eagerly awaited, and well worth a visit even if you cannot read the verses. Hand painted, some are lit with candles or gas burners. But, back to Basel, where a second aspect of Fasnacht is military precision. Processions are marked by timing and signals, marching in formation, drums and whistles, and a strict separation between active Fasnacht marchers and spectators. This is a significant difference between Basel’s Carnival celebration, and any I’ve seen elsewhere. For the Cortège, the grand parades of Fasnacht, spectators are separated from marchers. As a group like this Gugge band marches past a Fasnacht-Comité inspection stand, they go into high gear, with especially lively (and loud) numbers for the judges. Finally, the Church gets a nod too, even in reformed Basel. 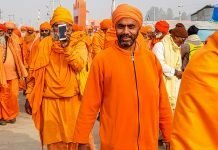 With the world turned upside down before Lent begins, Carnival is a time when governments and authority can be satirized without fear of sanction. Food–represented by confetti, fruit and vegetables– is distributed to the masses (although for Fasnacht, the distribution is made from huge parade wagons, by buffoons in costume). Everywhere, fasting foods such as flour soup are eaten, in Basel’s tribute to the original Catholic tradition. Characters called Waggis toss oranges, sweets and confetti into the crowds lining the streets for Fasnacht’s grand parades. Fasnacht is not a time for a spectator to sport green hair, a face mask of any sort, or other Carnival regalia. Only locals participating in Fasnacht as marchers and other helpers, are costumed! Their costumes come in many forms, including some with roots in old cross-border rivalries, military history or the Italian Commedia dell’Arte. 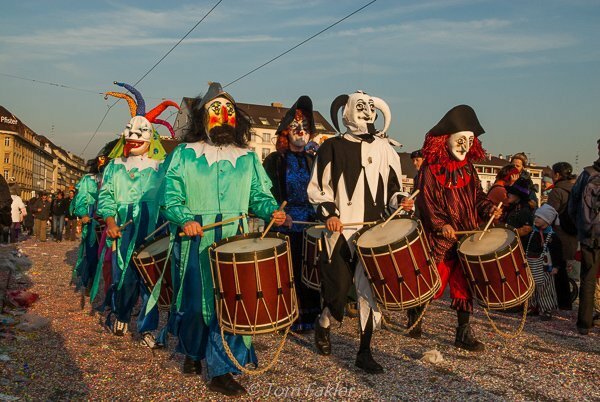 To see what they’re about, take a look at Through the lens: the characters of Basel Fasnacht. 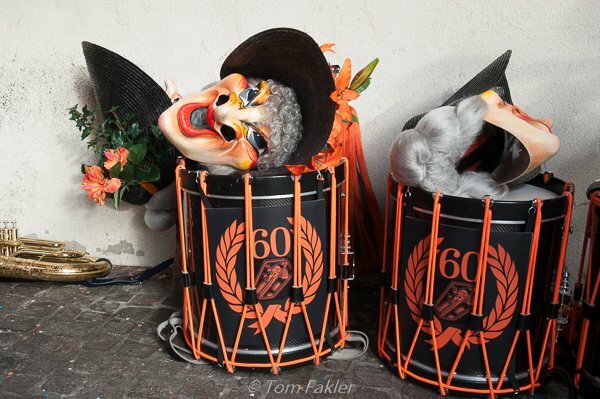 Fasnacht marchers park their drums and masks outside the restaurant when it’s time to take a break. Last year’s Fasnacht had more than 20,000 active participants and around 12,000 marchers in the official parades. At least 100,000 spectators can be expected to crowd into the Old Town for Morgenstreich, the Monday morning kickoff of the festivities. Buy a copy of the booklet Rädäbäng, which lists the officially sanctioned groups marching in parades and provides a map of the route, along with a wealth of detail about the current year’s Fasnacht (be aware, it’s mostly in dialect!). The official Fasnacht schedule is followed to the letter. To find out when and where to see parades, concerts and exhibitions associated with Carnival, visit Basler Fasnacht Online (website in German). Given the special nature of Carnival here, there are a few important rules a visitor should be aware of. The first, of course, is the prohibition of costumes for spectators (except for children, who have their own Fasnacht on Fasnacht Tuesday). 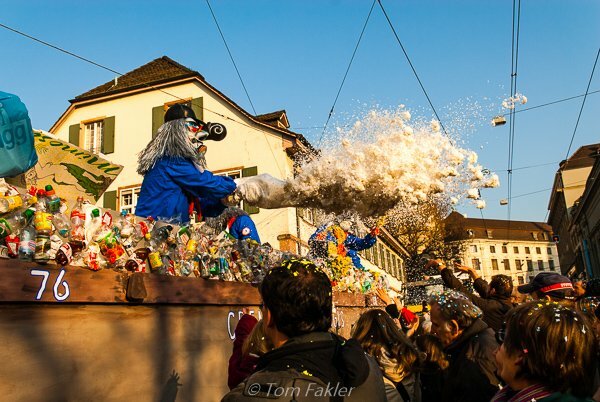 Check out the The (mostly unwritten) rules of Basel Fasnacht. 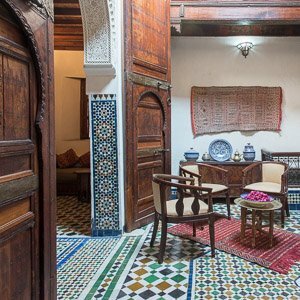 In the absence of complete understanding of what is going on, just relax and wander the streets of the Old Town, stop and enjoy something to eat and drink…and marvel! Fasnacht is a lively combination of modernity and medieval ritual, and the mood is a compelling mix of celebration and melancholia. 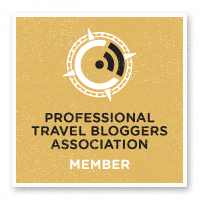 Trust me, it is like no other Carnival you are likely to experience! I visit the Basler Fasnacht every year and I’m always stunned by those amazing Fasnacht costumes, the absolutely amazing music and the outstanding performance of the groups attending the festival. 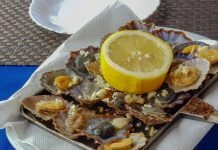 A great posting about an outstanding festival with absolutely amazing pictures!! Totally worth my time ;D And who is Tom Fakler? Those pictures he made? Great work! Brilliant shots!